All you need to know about making and serving the ULTIMATE Maine Lobster Rolls. A flavor-packed, scrumptious lobster roll made with buttery lobster and homemade lobster roll buns. Cook lobster according to directions here. I prefer to steam cook the lobster. Follow the instructions on the same guide to remove all the lobster meat from the shell. Chop the lobster meat into big chunks. You can leave the claw meat whole if you prefer as well. Toss the lobster in the melted butter (optional). Set aside. Finely chop the spring onions and put it in a bowl. Add about ⅓ cup of mayonnaise, a generous pinch of celery salt, and black pepper. Mix well. Add the butter coated lobster into the mayonnaise mix and add lemon juice to taste. Cover bowl with plastic wrap and refrigerate until needed. You will need a stick blender and a tall container that just fits the stick blender. Do not use a bowl, or a large container for this recipe. Crack the egg into the container, followed by a pinch of salt, mustard, lemon juice and vinegar. After these ingredients are placed in the container, slowly pour in the oil into the container - along the wall, so that the egg remains at the bottom. Place the stick blender in the container, with the egg yolk underneath the stick blender blades. Without moving the stick blender, start blending and hold it in place for about 10 - 15 seconds. You will start to see the egg and oil at the bottom of the container turn white. Next, move the stick blender up and down to mix the rest of oil and to make a thick mayonnaise - another 15 to 30 seconds more. It should be smooth, thick and spreadable. If it’s too lumpy, mix in a little water. Taste the mayonnaise and add more lemon juice or salt if needed. Place the mayonnaise a glass jar with a tight lid and store in the fridge, for up to 5 days. You can buy New England lobster roll buns, or make them at home using this recipe. 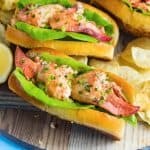 Spread butter on both sides of the lobster roll buns. Heat a non-stick pan over medium heat. Toast both sides - about 3 to 5 minutes per side. Set aside. When the toasted buns are cool enough to handle, use a serrated knife to split the buns on top. Line each bun with lettuce leaves. Fill each bun with 1/4 of the lobster filling. Sprinkle extra chopped spring onions or chives on top. Serve with lemon wedges, chips or fries. If you prefer, you can choose to serve with other side dishes and drinks as described in the post.